Earth's End: Earth's End at Chromacon 2017! Earth's End at Chromacon 2017! The Earth's End Publishing team will be featured guests at the Chromacon Arts Festival this weekend, April 8th -9th in Auckland! So what is Chromacon you ask? It is a FREE two day arts extravaganza, that celebrates the best homegrown independent creators of illustration, comics, 3D/scuplture, animation and videogames. This is your opportunity to meet these creators in person and support their work by buying directly from them: books, art prints and some much more! Earth's End Publishing will be launching our collection of James Davidson's Moa at the event. 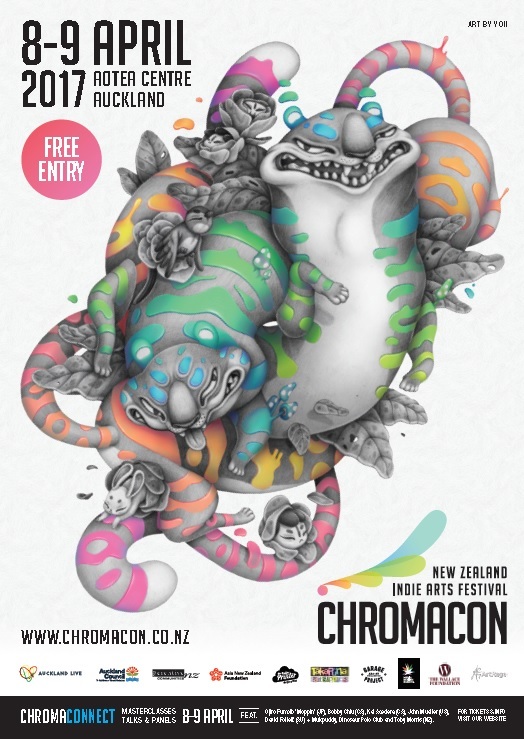 So come down and get a signed copy from the artist himself, in Auckland for this festival only! Ant Sang will be joining us on the Saturday to sign and sketch in copies of his acclaimed graphic novel, The Dharma Punks. Editorial Director Adrian Kinnaird will also be at the booth all weekend signing copies of his seminal NZ comics anthology, From Earth's End: The Best of New Zealand Comics, and our re-release of the classic kids graphic novel, Terry Teo and the Gunrunners by Stephen Ballantyne & Bob Kerr. There will be over 100 creators at the event, as well as a series of talks with international and local creatives at Chroma Connect (for ticket information for the Chroma Connect talks, check out the website HERE). This is a FREE event, taking place at the Aotea Centre, Saturday 8th and Sunday 9th of April, from 10am - 5pm. So come out of the wet and wild weather and celebrate creativity! For more information, visit the Chromacon website HERE.